Today, proceed to the sacred town of Dwarka. 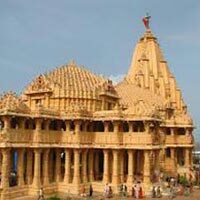 Major Tourist Arrive for Dwarka Tourism. Visit Dwarkadeesh Temple. Take a holy dip in Gomti river, later leave to visit Nageshwar Jyotirling, Gopi Talav, Bet Dwarka, and on way back do visit Rukmani Temple, evening visit other temples on coastal area, attend evening aarti at Dwarkadish temple. Overnight stay at the hotel. In the morning depart to Porbandar (75km/1.5hrs) at Porbandar visit Kirti Mandir - the place where Gandhiji was born and Sudama Temple - The only Sudama Temple in the world. 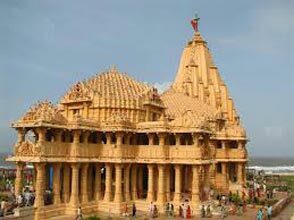 Later proceed to Somnath (130km/2.5hrs) on arrival visit Bhalka Tirth, Triveni Sagam, Geeta Mandir Chopati & Somnath Temple. In the evening attend Aarti and later watch light and Sound show run by Gujarat Tourism. Overnight stay at the hotel.